Intervention has been quite the buzz word the last year or so, hasn't it??? At least it has been in my neck of the woods. Generally, teachers are very comfortable doing intervention in literacy, but what does good, research based intervention look like in math? 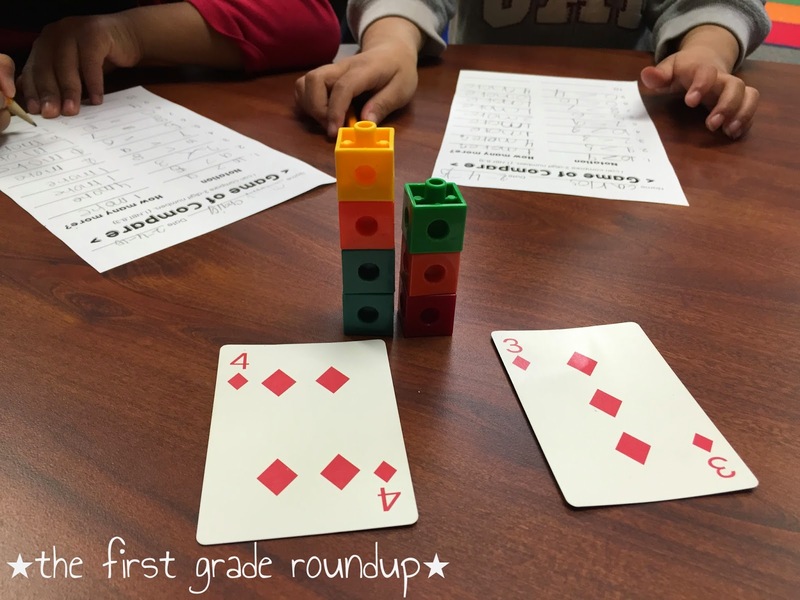 I'll be blogging about ways I used intervention in my math instruction last year over the next few days. Once a week I try to work on a specific math skill with some sort of game. Last year I wasn't as consistent as I hope to be this year. 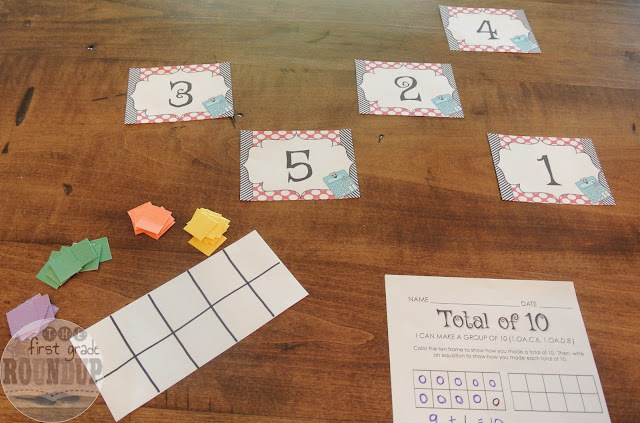 Sometimes I think math games need to be limited because it can be hard to differentiate games to meet the needs of all learners. But I have a core group of games that I have used over the last 10 years that are the best of the best. 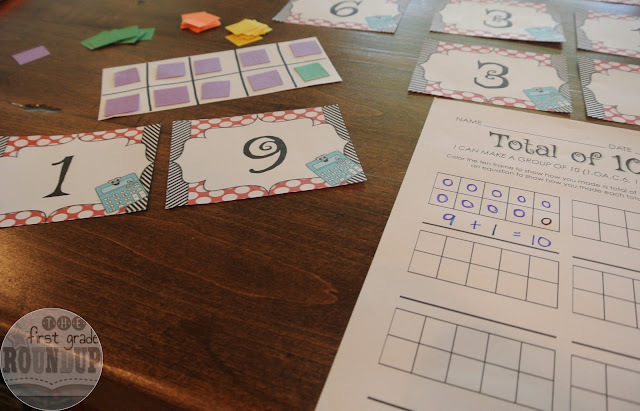 They are tied to base 10 understanding and building flexibility with composing tens, which I believe is the basis for deep math understanding and success in the CGI classroom. Again, this is another opportunity to pull a small group after I get everyone started. 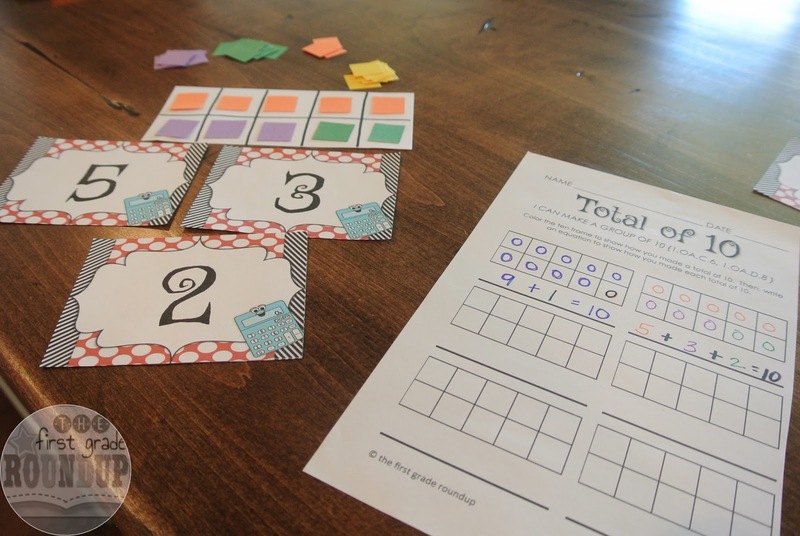 All of my print and play math games are easy enough that kids can play independently after modeling or playing together for 5 minutes or so before partner practice. During math skill games, I mainly pull my strugglers. We play the same game with additional support. 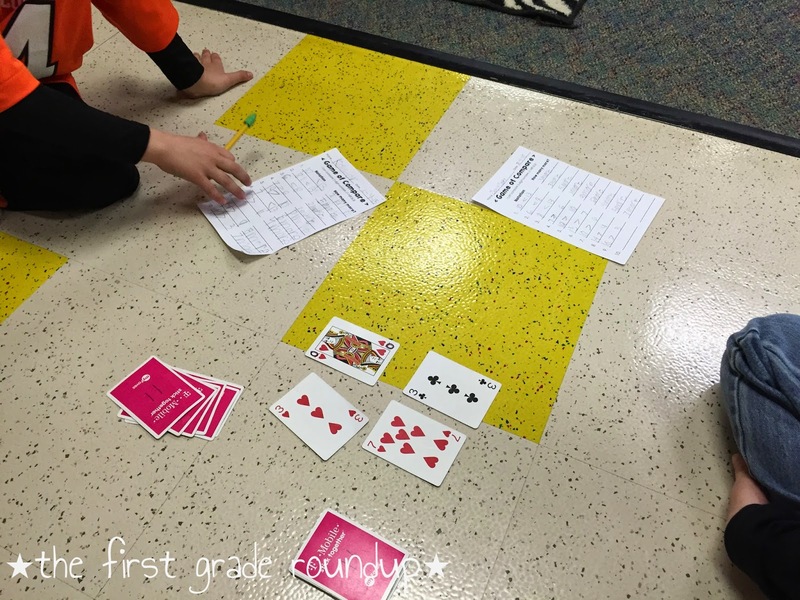 Here is the Game of Compare from the packet. This is what it looks like in partner practice for on grade level kiddos. Here is my intervention group on that same game. 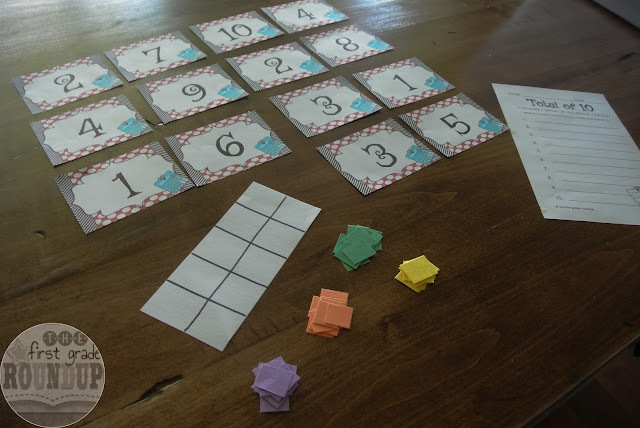 Same game, same rules, but I added the pop cubes to help give them a visual for comparing--connecting it to the idea of a graph. 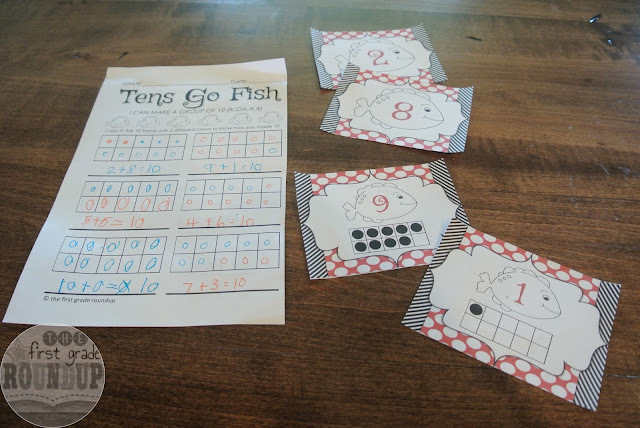 Here's another game that I've been using in one-on-one tutoring this summer: Tens Go Fish. I didn't get action shots of us playing the game since it was one-on-one, but it's just like go fish, but finding pairs that make 10. Using the ten frame is a great scaffolding tool for my strugglers. Such a powerful tool, but I do like to go back and forth with them from using the frame to doing it without or with fingers, just to give them a variety of visuals to experience. That's super important to me because I think it helps the transfer of their learning. Then, we record how we made 10...with the same colors of course (!) and write our number sentence to match. This one is a favorite of my kids at all levels. My highs love it because it really is a challenge (even for adults) to completely clear the board. I've only had a handful of kiddos clear the board in 9 years of teaching!! Need an extension? Play Total of 20 instead! And these are just 3 of the 10 games included in my math games packet. This packet includes scaffolds for your strugglers and extensions for your high kiddos too! 4 blog posts later and we are up to a grand total of 120 minutes or 2 hours of intervention each week that is available to me! Knowing I have that much time to intervene....how can I even think about not using that time. That's some major bang for my buck right there! How do you use intervention in your math classroom? You spent a lot of work to make all this. Any way thanx for your effort and this good work. keep it up. 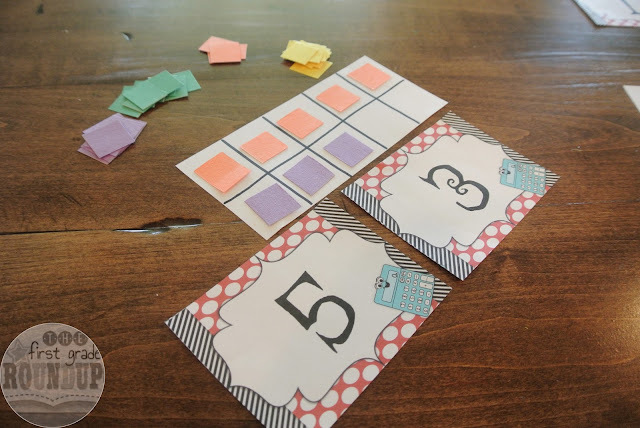 Math games are helping for kids to learn math. And this is the modern way to teaching kids.